The firearms manufacturer Star Bonifacio Echeverria went out of business in 1997. This is not a commercial website, and I have no firearms or parts. It is however your only real source of information on Star firearms online. Despite being very popular, I can't use advertising to defray my costs of running it since the Internet is scared of guns. So, I've made a few Star-branded products for you. You can't get this stuff anywhere else. I hope you enjoy these products, but also appreciate your support of the site. You have my permission and encouragement to spread this info around to your friends or favorite gun forum as well. I have never, even back when the company existed, ever seen Star stickers for sale. Well, that is over! I have made quality, weatherproof, die-cut vinyl stickers to put on your gun case, the back of your truck, or wherever you want to tell everyone what your favorite pistol or SMG is. Stickers are 3" in diameter, and each order gets one of each – a reproduction of the last and most common logo (the blue ring) and an interpretation of the branding used during the earlier days, but used in part for many decades. 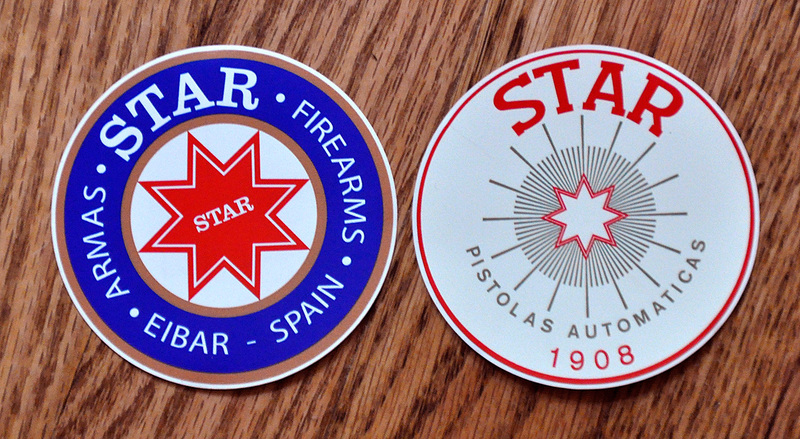 Wear Star T-shirts to the range, or keep a Star mug on your desk. And if none of the offerings work for you, contact me with what you want. I might be able to make it easily as well. Pretty much all the handgun manuals available to me now have been scanned, cleaned up, organized and gathered into one large document. They are now available for you to take home in printed form. This is a soft-cover book, 227 pages long, with enough manuals and some hints about how to understand family relationships that you can disassembly practically any Star handgun. I also have all the manuals available as FREE downloads, but if you think you will refer to it again and again, have multiple Star pistols, or do this work for a living, you need the printed version. I'll also happily take straight up donations. If you like my work, and have spare money, throw a few bucks my way. It'll help.